I would like to think everyone reading this knows who Bill Finger is. At least at a high level. Realistically, that's probably not the case. That's why Marc Tyler Nobleman's latest book is called Bill the Boy Wonder: The Secret Co-Creator of Batman. Finger was the man that Bob Kane went to to help design and develop his original "Bat-man" idea. Finger was the man who wrote nearly all of the original Batman stories while Kane (and increasingly frequently, ghost artists that he hired) drew them. Finger is also the one who was largely hidden away from the limelight that Kane eagerly accepted. Nobleman's book chronicles Finger's life beginning in 1933, shortly after Finger graduated high school. It traces how he and Kane met and developed Batman, and then follows Finger's career largely anonymous career as a writer through the 1960s. Interestingly, Nobleman carries Finger's story on through 2005, despite Finger himself dying in 1974. He then adds an Author's Note at the end talking about some of his research and, perhaps most significantly, finding a previously unknown heir! This is, I believe, the first real biography of Finger. The only other possible contender to that might be Jerry Bails' one page piece that ran in a 1965 mimeographed fanzine. I can't laud enough praise on Nobleman for tracking down everything he was able to. And Ty Templeton's art does a good job capturing all the personalities involved. The one aspect that I'm a bit ambivalent about is the format itself. It's presented as a picture book, much like Nobleman's Boys of Steel. Now, there's nothing inherently wrong with the format and it does make some sense given the topic, but as it's the first biography of Finger, the format does make the book seem a bit light. I don't know that that's fair to Nobleman, putting the weight of nearly three quarters of a century's worth of oversight on his shoulders when it should be the burden of all writers of comic history (myself included). Nobleman writes the book well but, as something of a researcher/historian, I wanted to see a lot more. But, again, not what Nobleman was aiming for in the first place. On the other hand, writing it as a picture book means that kids are more apt to pick it up. Which, in turn, means that they'll be reading about Finger and have some knowledge of him at a much younger age. They'll grow up knowing that two men created the Dark Knight unlike, say, myself who never heard Finger's name until the first Tim Burton Batman movie came out. They won't have to overcome years of indoctrination (for want of a better word) into the mindset that Kane created Batman by himself. I should mention, too, that the Author's Note at the end is just straight prose, and contains a lot of information about the legal issues surrounding Finger and his legacy. Not really kids' stuff, but very interesting and useful for guys like me. Nobleman also includes a bibliography with a number of relatively obscure sources that might be worth tracking down for more specific details and anecdotes. The book is a quick read and contains more information about Finger that was new to me than Larry Tye's latest 400+ page book has new (to me) information about Superman. 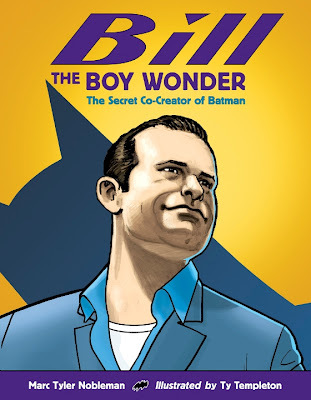 Until/unless Nobleman announces he's going to do a full-on, aimed-at-the-adult-comics-crowd biography, Bill the Boy Wonder is definitely worth picking up. Thanks for the review! I appreciate your take. Didn't even realize this book was made. Good thing I read your blog. Now this is another OGN added to my read list. Thanks for asking first. You may quote from my blog but please (as you offered) both link back and state the source for those who don't follow the link.